Page content last modified: November 19, 2010, added the 1885 and 1895 census transcriptions. December 17, 2009, added detail on Emanuel, Mary Cain, Emanuel's third wife - Matilda; added detail on John Jacob Greenly and Eva Alice Knapp. April 30, 2009, added burial location for John and Rebecca Cain. November 21, 2005, added the cause of Sarah's death. Sarah Winkleman was born in Northumberland County, Pennsylvania, on November 20, 1849, if we calculate her birth date from the inscription on her tombstone, the daughter of Jacob and Barbara Winkleman. In the late 1860s she became the wife of Emanuel B. Greenly. In the 1850 Federal Census of Pennsylvania, Emanuel was still living with his parents, John and Sarah Greenley. Once Emanuel left home, he always used the spelling Greenly. At the time of the 1870 Federal Census, Sarah, Emanuel and two young daughters were living in Point Township, Northumberland County. Near neighbors were Charles and Susannah (Foss) Callihan, who had resided in Hancock County, Illinois, in the late 1840s and/or early 1850s, returned to Pennsylvania prior to 1860, and who then moved back to Hancock County sometime between 1870 and 1880. Three more children were born to Emanuel and Sarah. In the late 1870s the young family left Pennsylvania and settled in Hancock County. Had the Callihans told them about the fertile farmland there? We'll probably never know. i. Anna M Shamlen Greenly, called Annie, also found as Anna M. Green, born in 1866 in Pennsylvania. She died April 6, 1932, in Tennessee Township, McDonough County, Illinois, and was buried at Friendship Cemetery in McDonough County. Anna and Mary Ellen married brothers. ii. Barbara Greenly, born about 1869 in Pennsylvania. iii. Mary Ellen, born in 1871 in Northumberland County, Pennsylvania, perhaps in Point Township. Mary Ellen spelled her maiden name Greenley. She died October 2, 1942, and was buried at Friendship Cemetery. iv. John Jacob Greenly, born June 22, 1873, in Pennsylvania, died January 20, 1957, in Pine County, Minnesota. He married Eva Alice Knapp on September 1, 1895, in Appanoose County, Iowa. Born May 10, 1879, according to her death certificate, she was the daughter of James Ira Knapp and Mary Ann Loveday Graham Knapp. She died December 10, 1957, in Pine County. v. Wilhelmina Gertrude Greenly, called Gertie, born December 20, 1876, in Pennsylvania. Just five days after her 15th birthday, she married John William Sammons. She died January 15, 1968; her last residence was reported as Princeton, Scott County, Iowa. 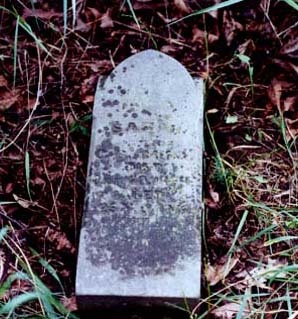 Sarah died on October 20, 1879, and was buried at Willis Cemetery. The Mortality Schedule associated with the 1880 Federal Census of Hancock Township reported the cause of death was puerperal fever, which indicates she had recently given birth. We have found no further evidence of this child. In addition to being counted in their father's home in 1880, Anna and Gertie were also counted in the Hancock Township residence of George W. and Mary Green. George was a Justice of the Peace; it was he who performed the marriage ceremony for Emanuel and Mary. The following spring, on March 3, 1881, 15 year old Annie married William P. George. George Green sent a note to the County Clerk giving his consent for "Annie M. Shamlen Green" to marry, stating also: "I hereby certify that I raised the girl..."
Eight years later Mary Ellen Greenley would wed John Henry George, William's brother. In 1885, Emanuel, Mary, Mary Ellen, John and Ira (the latter Mary's son from a previous relationship), were counted in Urbana Township, Monroe County, Iowa. When Gertie wanted to get married in 1890, she wrote to her father. His reply, from his home in Moravia, Appanoose County, Iowa, suggests that George Green was in ill health (he died the following February). Emanuel told Gertie she was too young to get married: "you aint dry behind the ears", but "if you want to get marrid and marrid it must be.... get marrid and i wish you well." Gertie used his letter as proof that she had his approval; it was placed in the files at the County Courthouse. It's worth a minute to read Emanuel's letter. In 1900, Emanuel and Mary were still residing in Moravia. John Cain had passed away in 1897, Rebecca Cain died in January of 1900; they are buried in Central Cemetery, Hire Township, McDonough County, Illinois. In 1910 both Emanuel and Mary were residents of the Iowa Soldiers Home (now known as the Iowa Veterans Home) in Linn Township, Marshall County, Iowa. Mary apparently died because in 1920 Emanuel was living with a third wife, Matilda, in a home on West Linn Street in Marshalltown, Marshall County. He died October 19, 1920, at Marshalltown, and was buried at the Soldiers Home Cemetery. A picture of his tombstone has been placed on Find A Grave. We have found nothing further on Mary or Matilda. Biographical and genealogical history of Appanoose and Monroe Counties, Iowa, compiled under the editorial supervision of S. Thompson Lewis, published in 1903 by Lewis Publishing Company. pp. 60-62 EMANUEL B. GREENLY. Emanuel B. Greenly, an honored veteran of the Civil war, who offered his services to the government when eighteen years of age and faithfully defended the old flag through the hour of the country's peril, is now successfully carrying on farming in Union township, Appanoose county. He was born in Lancaster county, Pennsylvaia [sic], in 1843, a son of John and Sarah (Buchter) Greenly, both of whom were natives of Pennsylvania and spent their entire lives in that state. They held membership in the Dunkard church and were people of genuine worth. Four of their sons, Andrew, Samuel, Amos and Emanuel, were volunteer soldiers in the Union Army. At a very early age Emanuel B. Greenly was bound out, and he had no opportunity to secure and education, but through his own labor he learned to read and write. His youth was one of unremitting toil and whatever he has achieved has been won through his own labor. With every department of farm labor he early became familiar. He was married first in Pennsylvania to Miss Sarah Winkleman, a native of that state. She died in Illinois, leaving five children: Anna, Barbara, John, Mary and Wilhelmina. In 1880 in Hancock county, Illinois, Mr. Greenly was again married, this second union being with Mary Cane, a daughter of John and Rebecca Cane. Mrs. Greenly, by a former marriage, had one son, Ira S. Wollin, who is now in Albia, Iowa. Mr. Greenly was but eighteen years of age when the Civil war broke out. He had watched with interest the progress of events in the south, and believing in the righteousness of the Union cause he enlisted at Lancaster, Pennsylvania, in 1861, as a member of Company C, Seventy-ninth Pennsylvania Infantry, under Captain Dysart and Colonel Hambright. Later his company was commanded by Captain Bone, and still later by Captain Dysart, and for three years Mr. Greenly remained with the army, taking part in a number of important engagements, including the battles of Perrysville, Stone River, Murfreesboro, Nashville, Chickamaugua, and Chattanooga. He became ill with typhoid fever and also suffered from other ailments. Because of this he was transferred to the Nineteenth Invalid Corp as a member of company G, commanded by William C. Alberger. For a time he was in the hospital at Washington, D. C., and also at Buffalo, New York, and in Elmira he was honorably discharged. He returned to his home with a good war record, for he had ever been loyal to his duty and faithful to the best interests of the nation. In 1877 or '78 he moved to Illinois. It was in the year 1880 that Mr. Greenly came with his family to Iowa, settling in Union township, Appanoose county. He here owns seventy-eight acres of good land, upon which is a stable, a good orchard, a wood lot and pasture lands, in addition to the richly cultivated fields. His time and attention are given untiringly to his farm work, and certainly he deserves great credit for what he has accomplished, owing his success entirely to his own efforts. He is a member of the Grand Army of the Republic, being associated with Sumner Post No. 398, of Moravia, and his wife is a loyal member of the United Brethren church. This was the household of Jacob Rohrer, 63, a prosperous farmer whose real estate was valued at 20,000, and his personal estate at 3000. There was another young man listed in the Rohrer home as well as an older hired man. Mary C, 41, female, married, born IN, both parents born U.S.
Mary E, 13, female, single, born PA, both parents born U.S.
John J, 11, male, single, born PA, both parents born U.S.
Ira Wallin, 13, male, single, born IL, both parents born U.S.
Another former Hancock County resident was counted immediately following the Greenlys: Susan Anna (Mort) Jones, with her husband, Nathan, and their children. Greenle, E B, 51, male, white, married, born PA, both parents born PA, farmer, religious belief - Lutheran, entitled to vote, Company C(1), 79th Pennsylvania, Arm of Service and Rank - C 15 pri ? (1)The C was entered in the wrong column.